There has been an abundance of spiders in the area where I live this Fall, and I love to observe their webs popping up all over, as long as they aren’t over my kitchen sink (which has happened and then they have to go). They work so hard weaving their delicate, deadly baskets. They catch a few flies, dismantle the web, and start all over again. 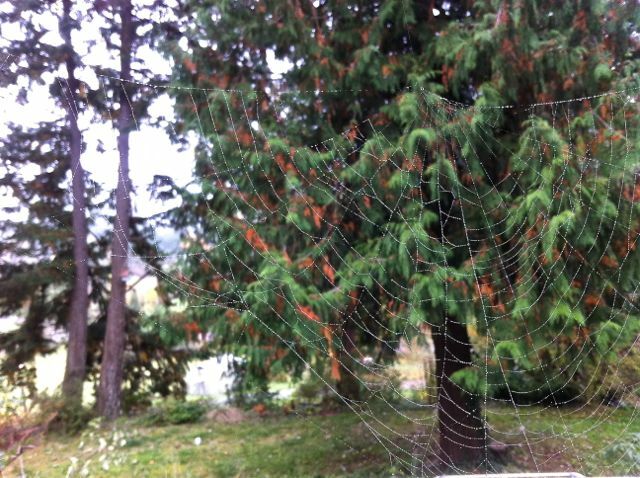 This photo made me think about the web of my own life. Weaving a thing of beauty, catching something or someone in it, enjoying it all for a while, experiencing disintegration, and then repeating the process again and again. After so many years of trying, of creating, of exploring, I wonder if I am learning anything after all. Are my patterns any different than they were thirty years ago? Has the web changed at all? I am laughing at myself as I write this, knowing that this true and not true all at the same time. Still laughing. Knowing that I am both the spider and the fly. So true, Susan! And we never know when we’ll be that spider who is in the kitchen and therefore “have to go”. Life can be full of those little surprises, too. May all of your web-spinning and surprises propel you on your journey.